Our primary goal is to guide our valued clients towards developing a solid financial structure that will stand the test of time and build their wealth for their family and future generations. To ensure we have you on the right path to success, we conduct an in-depth analysis of your financial situation. We then apply the collective knowledge of our financial planning team to develop a plan to help you achieve your financial and life goals. It is this strong planning process that enables our clients to achieve their long-term financial goals in a tax efficient manner. Our goals-based financial security planning approach is designed to help clients define customized short and long-term goals. It is also critical to identify roadblocks or gaps that might impact the financial planning strategy, and it is imperative to monitor the plan on an ongoing basis to ensure it meets any changing needs. But it doesn’t stop there. We believe wealth management involves a variety of strategies that are most effective when tailored to a client’s individual needs, goals and aspirations. With this in mind, in addition to our various financial planning services, we can also refer you to other highly knowledgeable professionals — CPAs, Attorneys, Actuaries, Pension Strategists, Risk Transfer Consultants, Family Business Psychologists and other advisers — who work closely with clients to build a customized financial plan designed to help them meet their goals in a tax efficient manner. We construct clients’ portfolios with leading money management institutions along with a proprietary “tactical” investment strategy overlay that has the potential to make money in both up and down markets. We take a conservative approach to investing with an eye towards higher returns and minimum risk. Our manager selection process is designed to pinpoint outstanding investment management talent, which we do by first screening the firms and, on an ongoing basis, through regular calls and/or meetings and on-site visits. We measure our success based on our ability to achieve the returns our clients seek rather than by how the general market indices fare mainly utilizing professionally managed mutual funds and exchange-traded funds (ETFs) for a cost-effective, conservative approach to managing money. Sustainable, Impact, and ESG (Environmental, Social, and Governance) Investing is growing dramatically in popularity and we believe it is essentially a risk mitigator and growth generator. Good companies all over the world are addressing environmental, social, and corporate governance issues to make our planet a safer and better place to live and raise our families. Accordingly, ESG can be an important addition to a sound investment portfolio because it helps avoid the potential pitfalls and hazards of intangible asset risk, and will also allow investors to vote with their money in ways we cannot yet imagine. The market crisis of 2007 and 2008 shattered many investors’ notions of the efficiency and stability of financial markets. This was not the first, nor will it be the last time that a market dislocation or “bear” stock market will occur. Accordingly, we feel it is imperative to also include a “tactical” component to an investment strategy that also has the potential to make money in both up and down markets to help reduce risk, improve performance and achieve long-term financial goals. Castle Financial incorporates such a critically important proprietary “tactical” component to client portfolios. As part of our commitment to our clients, we work to help you develop an investment philosophy that best encapsulates what you are looking to achieve financially. A thoughtful investment policy statement is the cornerstone of a comprehensive wealth management plan. A well-crafted statement defines investment objectives, risk criteria, manager selection procedures, measurement standards, monitoring procedures and asset allocation guidelines. The investment policy statement that we help our clients build addresses their specific situation and risk tolerances. From there, we create a portfolio of investment managers that fit each client’s investment objectives. At Castle, we treat our clients with the utmost respect and constantly strive to exceed their expectations. For the benefit of existing clients, we limit new accounts to individuals who are an excellent fit for our firm. We realize that providing high-quality client service is more important than bringing in a volume of new clients at any level of business. Charles Schwab & Co., Inc client Account Custodian. In addition,TD Ameritrade Institutional, Division of TD Ameritrade, Inc., client Account Custodian, Member FINRA/SIPC. Castle Financial and TD Ameritrade Institutional are separate entities. TD Ameritrade, Inc., is a member of the Securities Investor Protection Corporation (SIPC®). Securities in client accounts protected up to $500,000 through SIPC and TD Ameritrade also provides each client $149.5 million worth of protection for securities and $2 million of protection for cash through supplemental coverage provided by London insurers. For details, please visit sipc.org. In the event of a brokerage insolvency, a client may receive amounts due from the trustee in bankruptcy and then SIPC. Supplemental coverage is paid out after the trustee and SIPC payouts, and under such coverage, each client is limited to a combined return of $152 million from a trustee, SIPC, and London insurers. This policy provides coverage following brokerage insolvency and does not protect against loss in market value of the securities. Charles Schwab & Co., Inc has similar SIPC and private insurance. Castle Financial, Charles Schwab & Co., Inc. and TD Ameritrade Institutional are seperate entities. Castle Financial only transacts business in states where it is properly registered, or excluded or exempted from registration requirements. The Five Star Wealth Manager award program has been recognizing and promoting outstanding wealth managers since 2000. Five Star Professional conducts market research to identify excellent service professionals in over 45 markets across the U.S. They recognize wealth managers who meet our ten objective criteria. 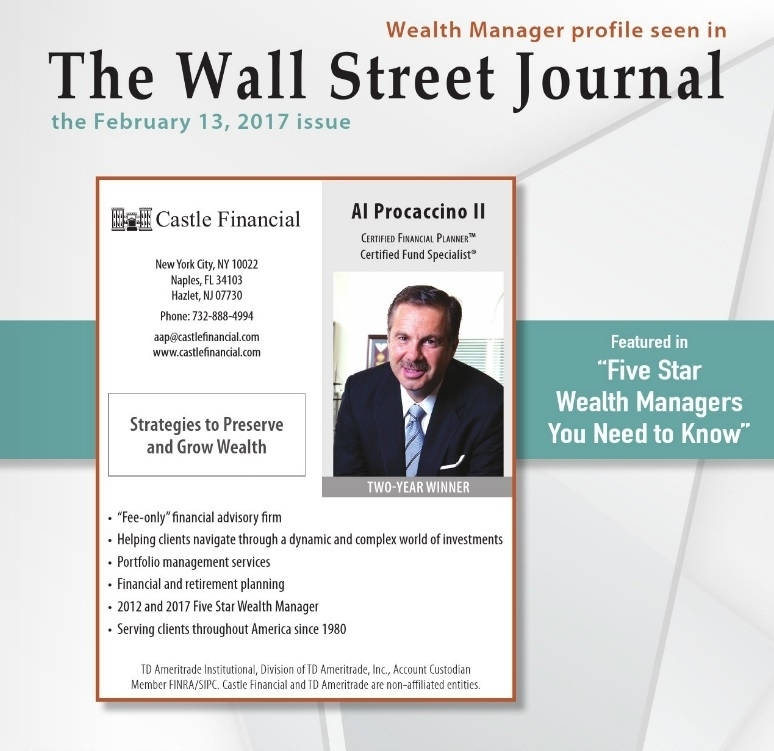 Al Procaccino II, President of Castle Financial, is a 3 time 5 Star Wealth Manager Award winner and also a former 5 Star rated Morningstar Institutional Money Manger. To receive the Five Star Wealth Manager award, a wealth manager must satisfy 10 objective eligibility and evaluation criteria that are associated with wealth managers who provide quality services to their clients. Factors considered include assets under management and client retention rates. Candidates also undergo a thorough regulatory and complaint review. To review our ten objective criteria and review our research methodology, click here.